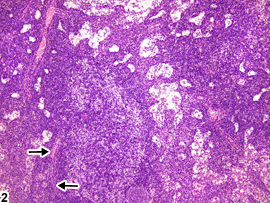 Lymph node - Atrophy in a female F344/N rat from a subchronic study. 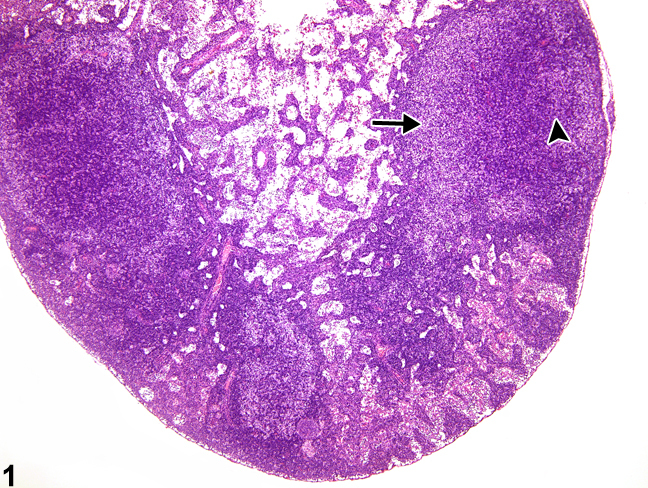 With early lymph node atrophy, paracortical lymphocytes are depleted (arrow), and number and size of follicles are decreased (arrowhead). 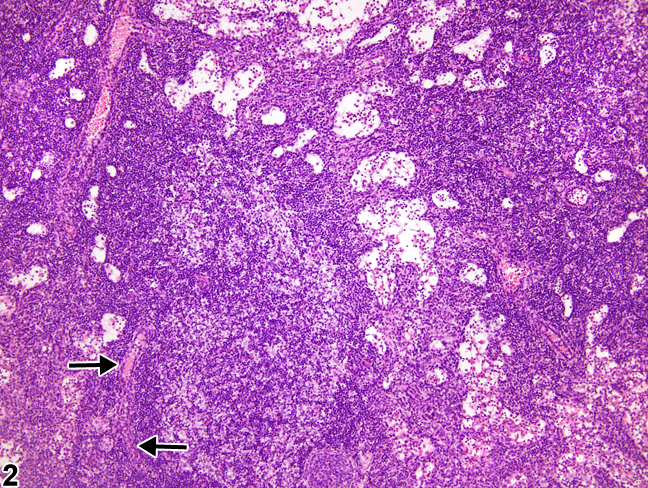 Lymph node - Atrophy in a female F344/N rat from a subchronic study (higher magnification of Figure 1). High endothelial venules (arrows) may be more prominent with lymphocyte depletion. Lymph node atrophy may result from any toxic insult or disease that causes lymphocyte necrosis or apoptosis. Changes may include depletion of paracortical lymphocytes ( Figure 1 , arrow), a decrease in the number and size of follicles with few to no germinal centers ( Figure 1 , arrowhead), and a decrease in cellularity of medullary cords; depending on severity, the paracortical stromal cells and high endothelial venules may be more prominent ( Figure 2 , arrows). Progressive loss of lymphocytes may cause shrinking (atrophy) of a lymph node that is apparent grossly or subgrossly. Atrophic lymphoid tissue may be replaced by adipose tissue and possibly collagen. The severity of atrophy may also vary between lymph nodes within the same animal. Atrophy may result from toxic insult but may also be seen in aged rats and mice. Age-related changes should not be diagnosed. Lymph node atrophy should be diagnosed and graded unless it is determined to be age related. Plane of section and location should also be considered when evaluating the lymph nodes. National Toxicology Program. 2004. 13-Week Study (No. C20306) of PCN 66/67 (CAS No. PCNCOMPARISN) in F344 Rats and Sprague-Dawley Rats (Gavage Studies). NTP, Research Triangle Park, NC.